In large bowl, beat butter, sugar, vanilla and egg with electric mixer on medium speed until light and fluffy. Add flour; beat on low speed until dough forms. Roll dough into a ball. Cover with plastic wrap; refrigerate 30 to 45 minutes for easier handling. Heat oven to 350°F. Divide dough into 8 equal pieces. On lightly floured surface, roll each piece into rope 14 inches long. Cut each rope into 4 (3-inch) and 4 (1/2-inch) lengths of dough. Roll the 4 (1/2-inch) pieces into balls and attach to 4 (3-inch) pieces as heads. On ungreased cookie sheet, place 1 inch apart. Press 2 chocolate chips, point sides down, in each mummy head for eyes. Bake 8 to 10 minutes or until very light golden brown and tops are set. Immediately remove from cookie sheets to cooling rack. Cool completely, about 15 minutes. In small resealable freezer plastic bag, place vanilla chips; seal bag. Microwave on High 40 to 60 seconds or until softened. Gently squeeze bag until chips are smooth; cut off tiny corner of bag. Squeeze bag to drizzle frosting in a crisscross pattern over cookies to look like mummy bandages. Let stand until set, about 20 minutes. These cookies can be made ahead and frozen. After they set up, they can easily be stacked. Cover tightly before freezing. 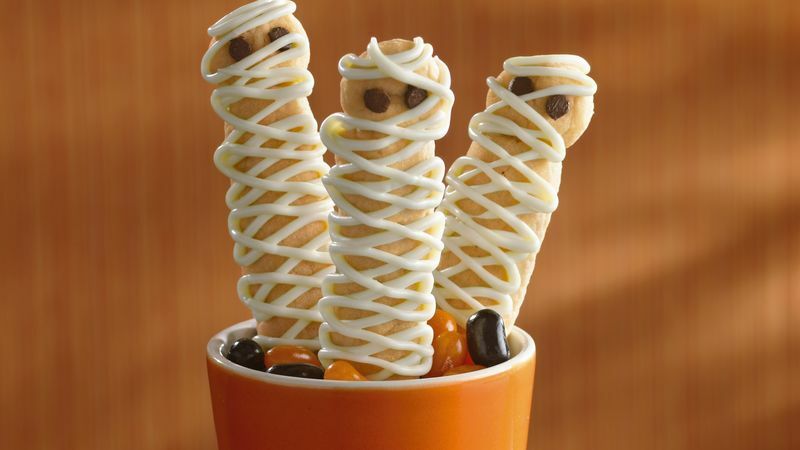 Prop these cute cookies up in a glass using orange and black jelly beans.